Ayurveda is a great life science providing the philosophy of life in which basic principles are described for obtaining good health. To maintain the health of healthy person and cure of diseased person are the two basic principles of Ayurveda. Panchakarma is the best way to achieve both principles discussed earlier and is practicing everywhere globally and is very popular among the Healthy and Diseased individuals. 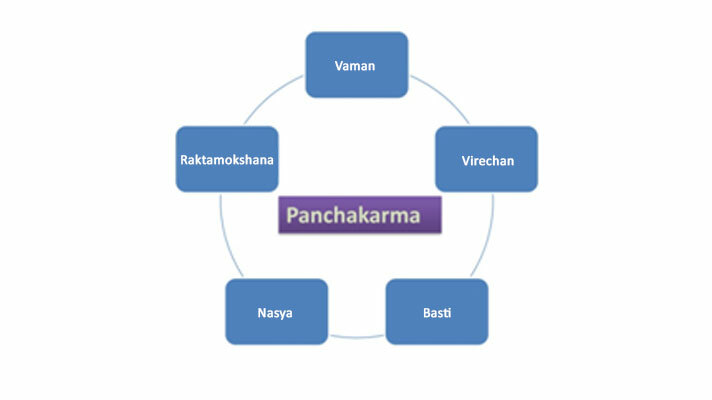 Even though it is popular but exact knowledge about the Panchakarma is not available. There is a believe in most of the people that massaging the body by oil, taking steam bath and pouring oil over head is Panchakarma and unfortunately it is only in the practice on the name of Panchakarma and that is only a probable reason by which the benefits of it is not reaching up to every individual. These are the main five procedures by which purification of body takes place and an individual can achieve good health. Each Panchakarma procedure is having pre and post procedures which are mandatory to take prior and after any of one Panchakarma procedure. In Pre procedures Snehana (Oleation by medicated oils and medicated ghee either externally or internally or both simultaneously depending on the type of Panchakarma Procedure) is administered which is followed by Swedana (sudation or fomentation or sweating by different methods) and then after getting proper signs of perfect snehana and swedana, Panchakarma procedure is administered. In Post procedure, specific diets are administered for 2 to 3 days, which is known as Samsarjan Krama. It is suggestive to each and every person that they should have proper knowledge of Panchakarma before taking it and these basics of Panchakarma will definitely help them a lot because proper Panchakarma can resolve all heath issues but not only by taking massages and steam bath.